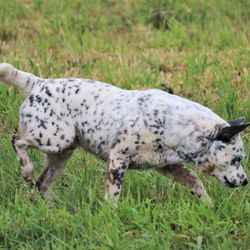 Health Testing: Clear of PLL, PRA-PRCD, and DM. 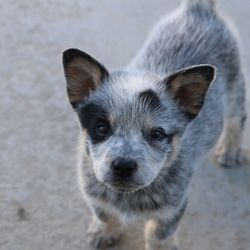 Meet the star of the show! 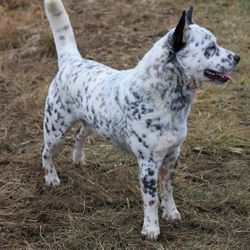 Blevins has a top notch temperament and big personality. 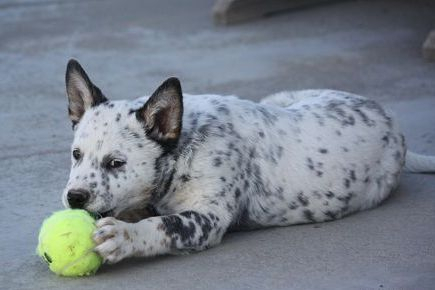 He is eager to please, loves to play fetch, loves swimming and running, and is always up for an adventure. 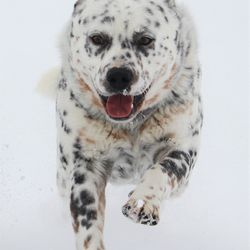 Really fun, happy dog! 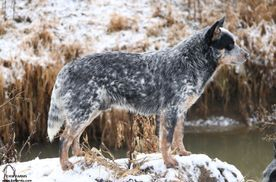 He is smart and athletic; confident and outgoing; affectionate and loyal. 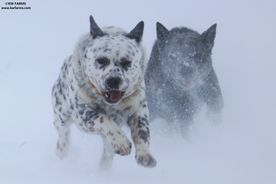 Shows a lot of natural herding instinct. 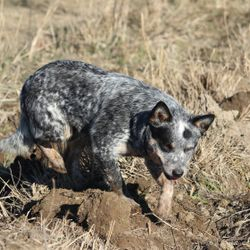 We have tried him a bit on goats and he seems to have a lot of natural ability. 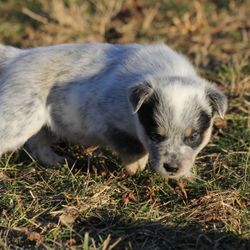 Hope to do more herding with him in the future. 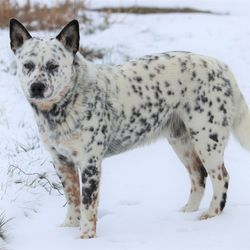 We were looking for a stocky male with an attractive head and face, good bone, balanced build, nice ears and tail, a friendly, confident disposition, and a blue mottled coat. 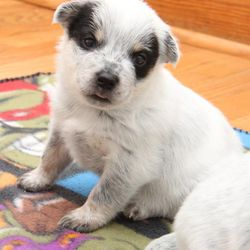 Blevins is everything we had hoped for and more! 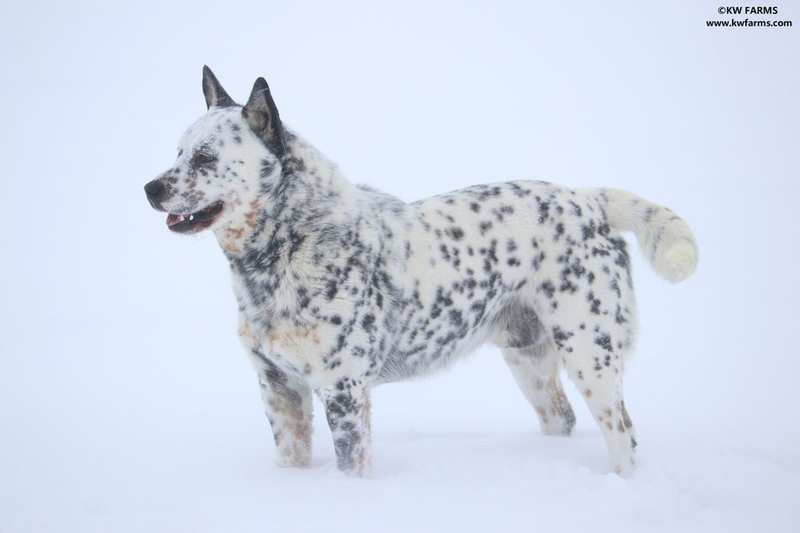 Truly a dream and an excellent example of the breed. 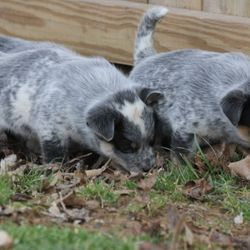 Blevins' first litter was absolutely gorgeous. 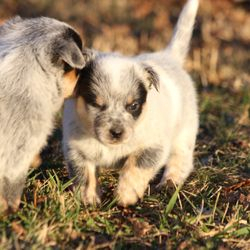 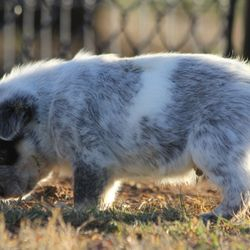 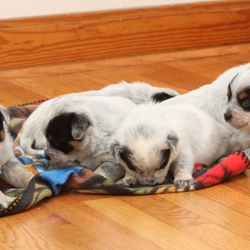 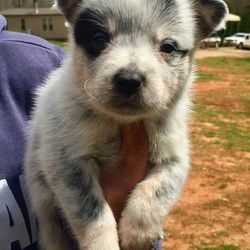 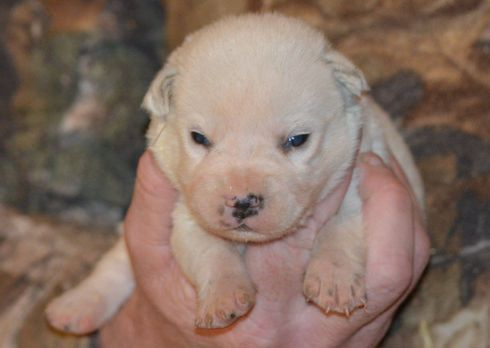 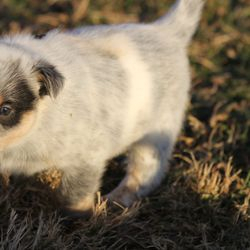 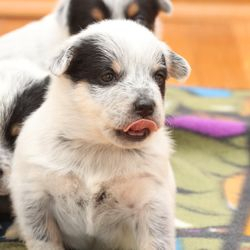 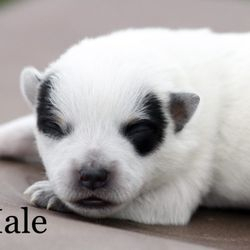 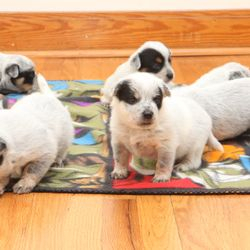 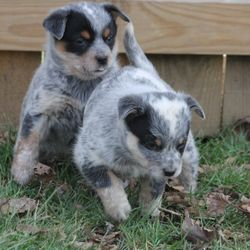 Beautiful, stocky puppies with outgoing and playful personalities. 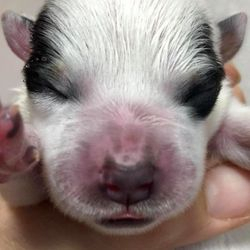 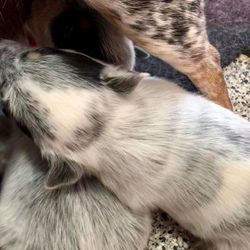 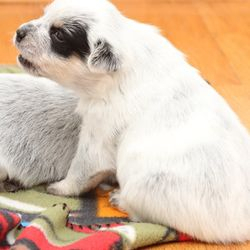 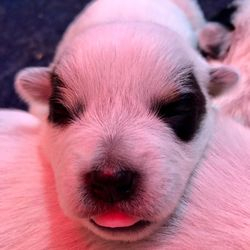 We look forward to seeing more litters from him in the future. 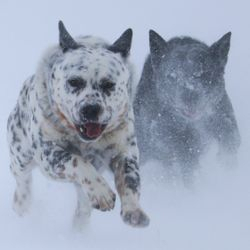 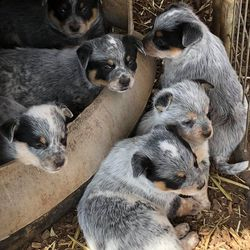 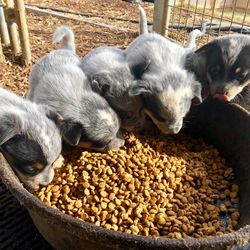 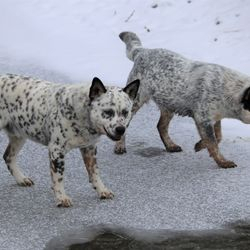 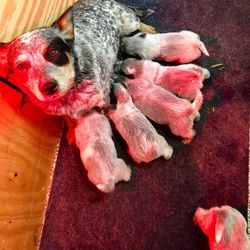 Photo above and to right, courtesy of Sleepy Hollow Cattle Dogs. 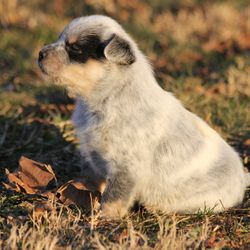 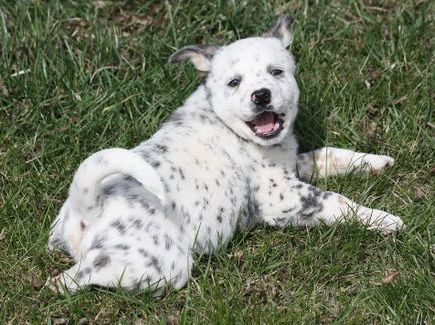 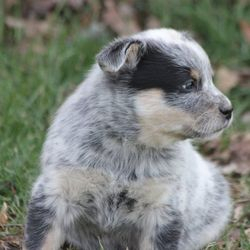 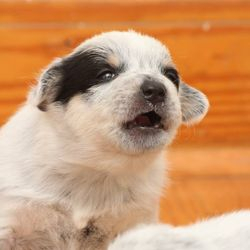 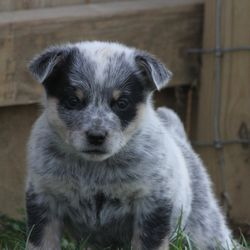 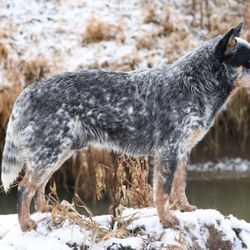 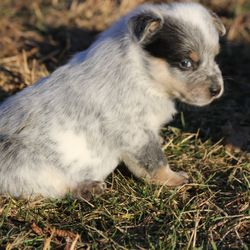 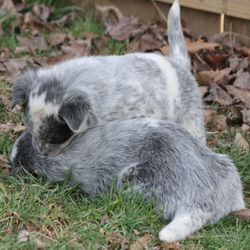 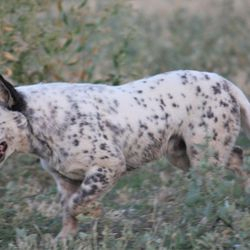 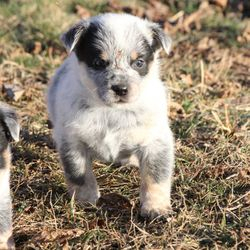 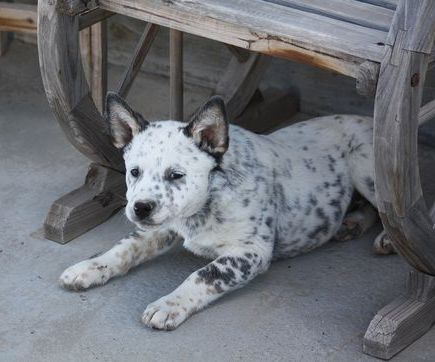 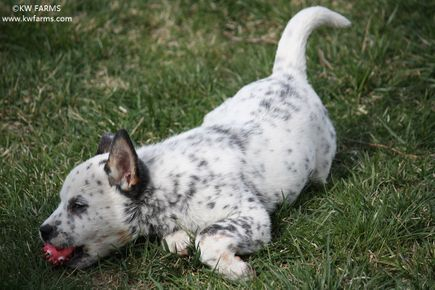 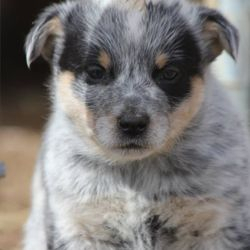 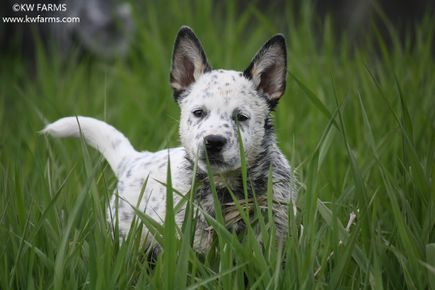 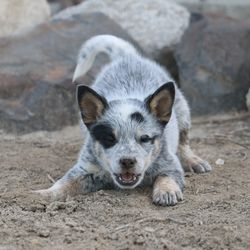 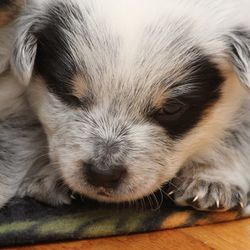 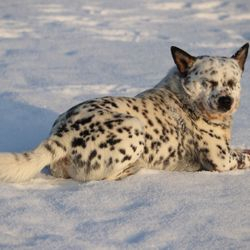 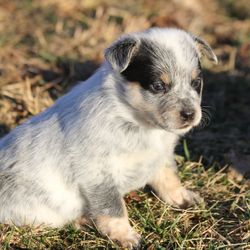 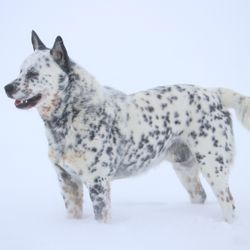 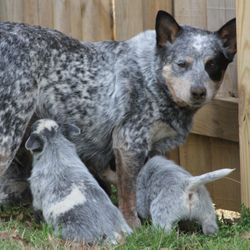 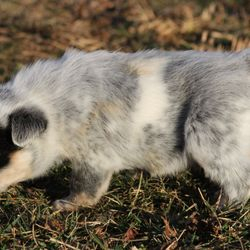 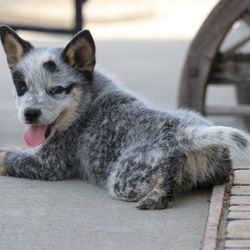 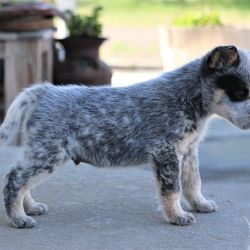 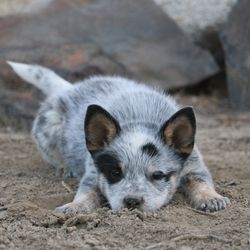 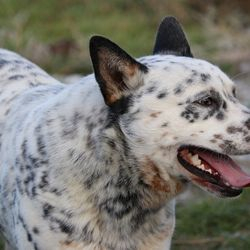 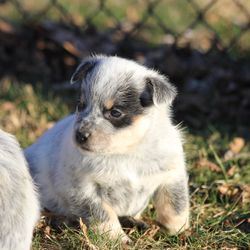 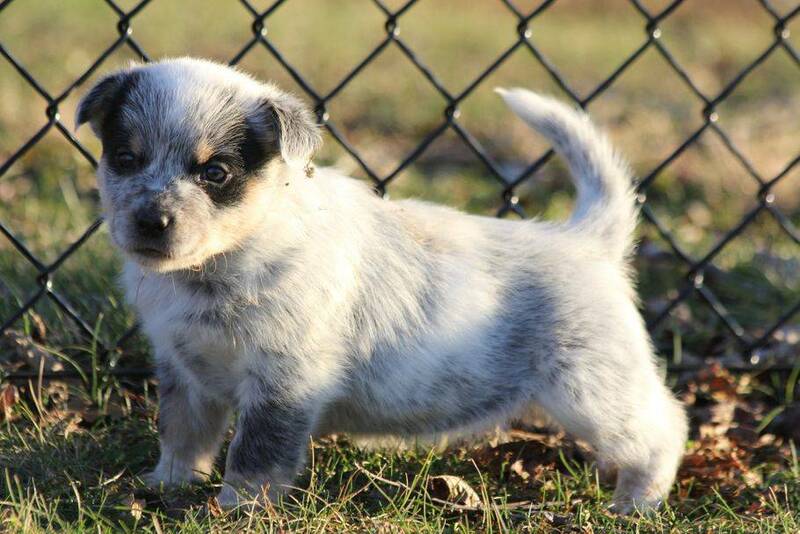 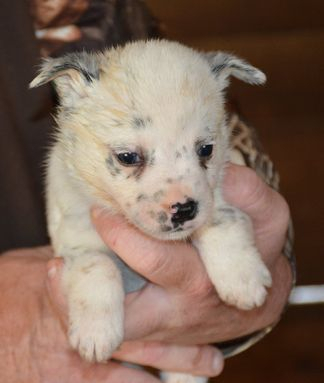 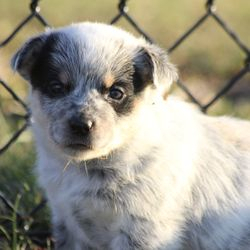 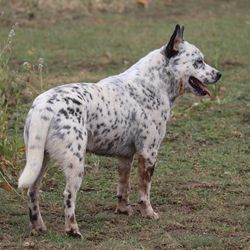 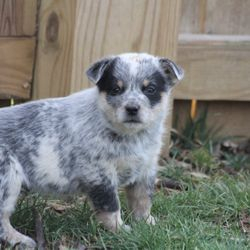 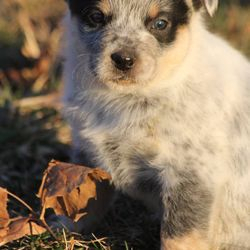 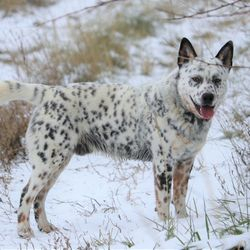 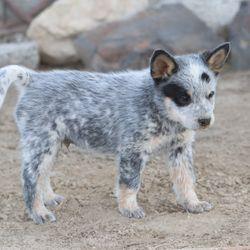 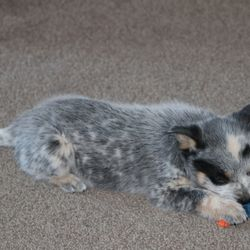 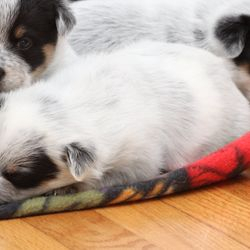 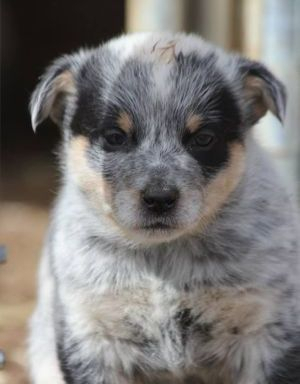 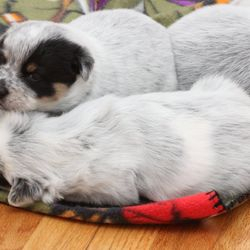 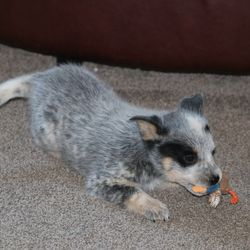 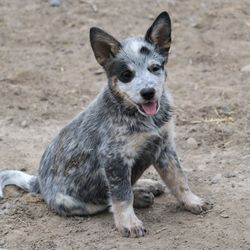 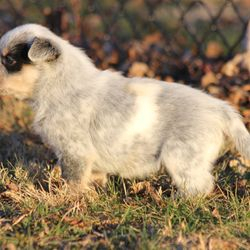 Color: Blue speckled with black and tan markings. 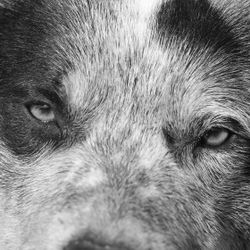 Health Testing: Clear of PLL, PRA-PRCD, DM, MH, and Cystinuria. 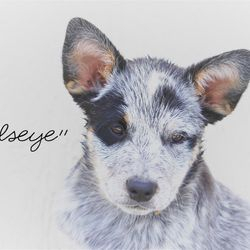 What an absolutely sweet and mellow boy Bullseye is! 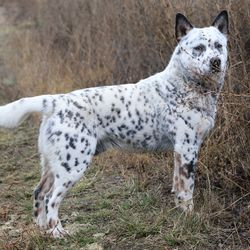 He is a nicely balanced guy with solid conformation. 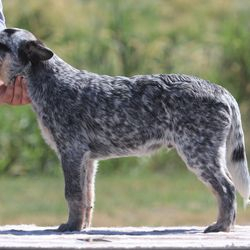 He is slightly related to Blevins through Happy Trails Son Of A Gun and South Mountain's Bar Vicxen By Nite. 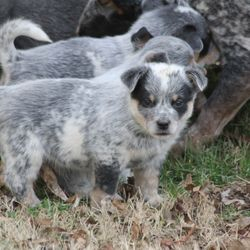 We have been very pleased with dogs from this line and hope to eventually cross him to a Blevins daughter in the future. 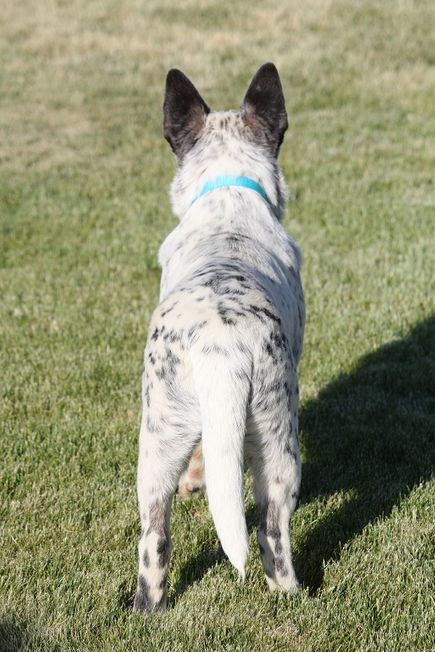 Bullseye shows a lot of interest in stock, is biddable, and smart as a whip. 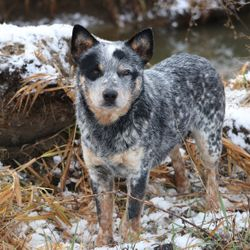 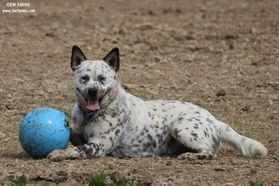 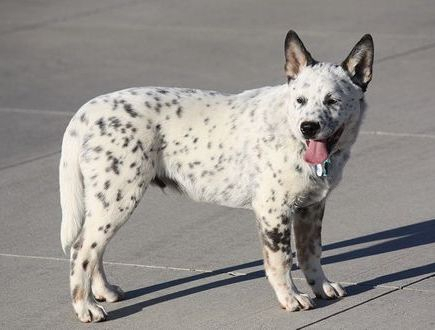 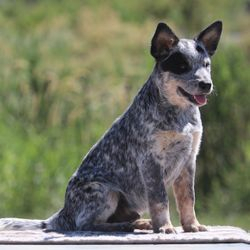 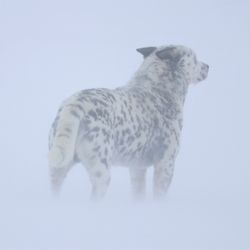 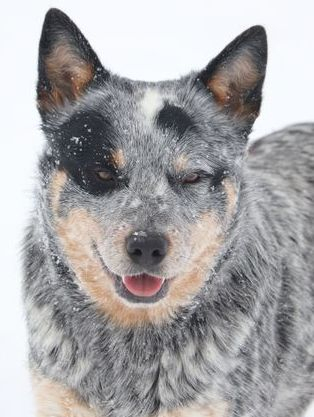 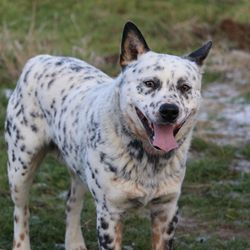 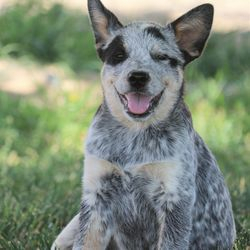 He's a typical cattle dog, but has a nice mellow temperament and is more laid back. 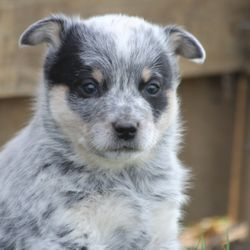 We are really looking forward to the future with this guy. 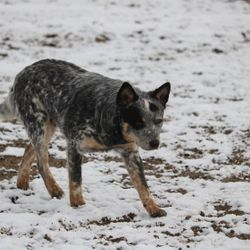 Photos courtesy of Blue Yonder ACDs. 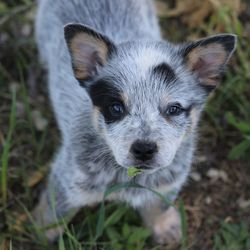 Say hello to Apache! 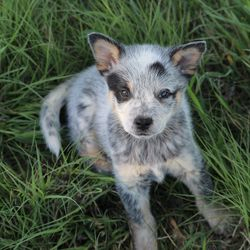 He is the newest addition to the farm and quite a busy and happy little guy! 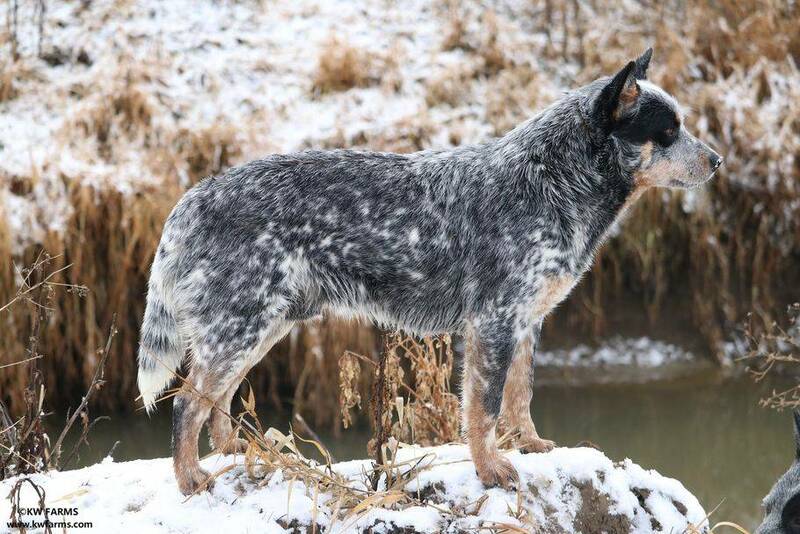 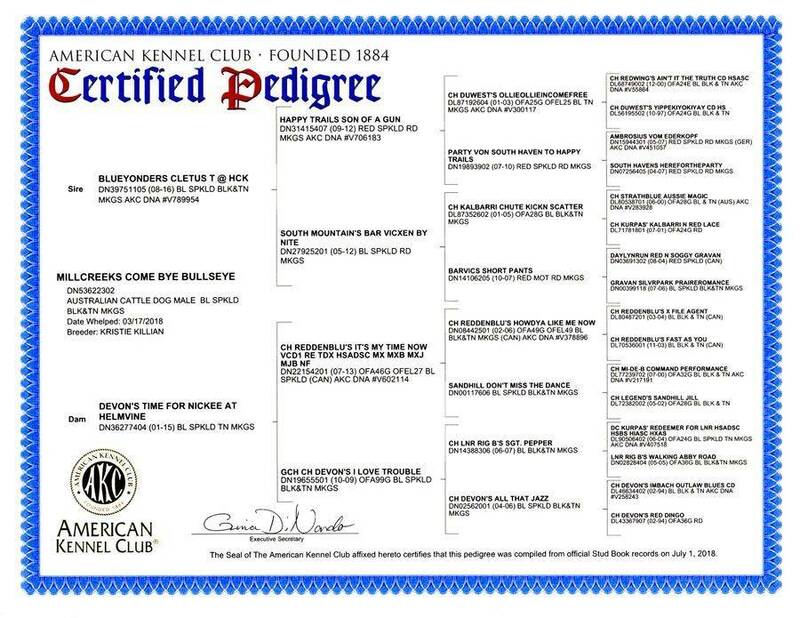 If all goes as planned, he will be a part of our breeding program in the future. 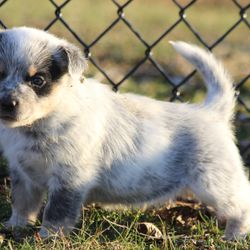 We look forward to watching him grow!